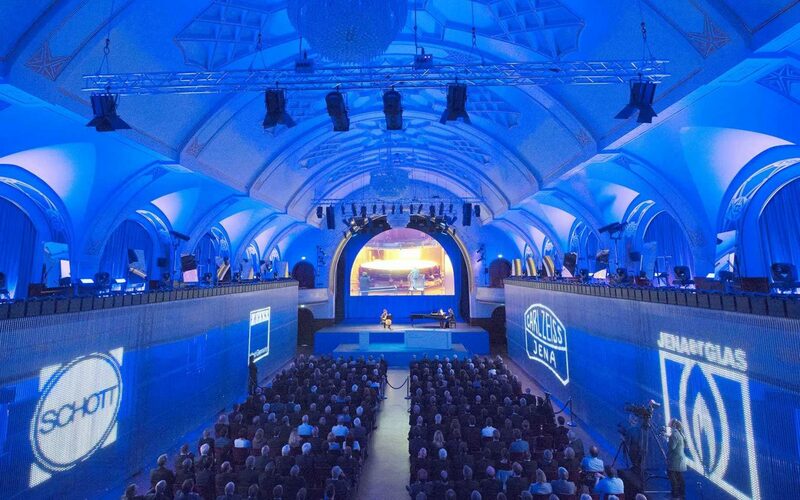 In May 2014, the Carl-Zeiss-Foundation celebrated its 125th anniversary in the Volkshaus Jena with German Chancellor Angela Merkel as a speaker, Minister-President of Thuringia, Christine Lieberknecht, and many other prominent guests. Milla & Partner was responsible for the contextual and spatial design of the gala event, including lighting design, projection, media and music production. Visual leitmotif throughout the production was a light beam. The light choreography in the air space of the venue led to a concentrated beam shooting over the heads of the guests to the stage, immersing itself in the canvas and continuing there as an animation. 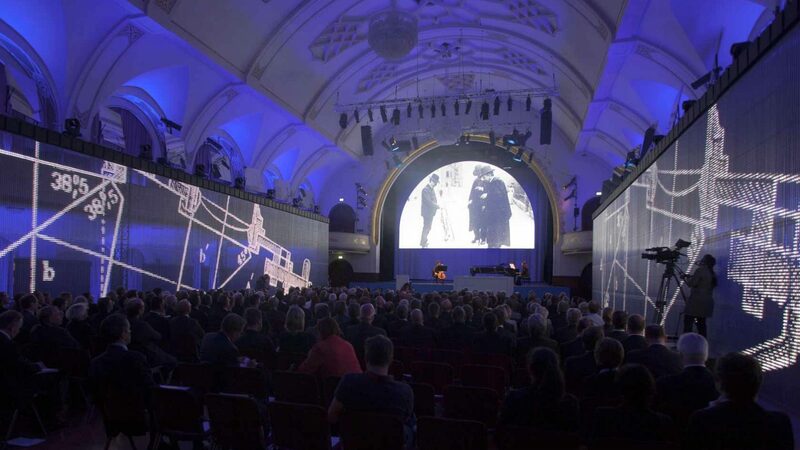 In the film on the arched screen, the beam took the guests on a 125-year journey from the founding years through reconstruction and reunification to current Foundation work. The dynamic feeling and the involvement of the audience was strengthened by the dramaturgically sophisticated interplay of light projection, stage film and visualizations on the longitudinal LED curtains surrounding the audience. The film was accompanied live by two Philharmonic soloists for cello and piano with a piece composed specifically for the anniversary. Classical musical virtuosity combined with modern media technology, the traditional Jena Volkshaus and the innovative lighting concept, LED curtains that allowed glimpses into the historical building depending on the display - Milla & Partner´s orchestration combined tradition and modernity into a befitting and convincing symbiosis to celebrate the Foundation´s anniversary. The history of the Foundation, as well as current projects, scientific institutions and research institutions are topic of the accompanying exhibition. 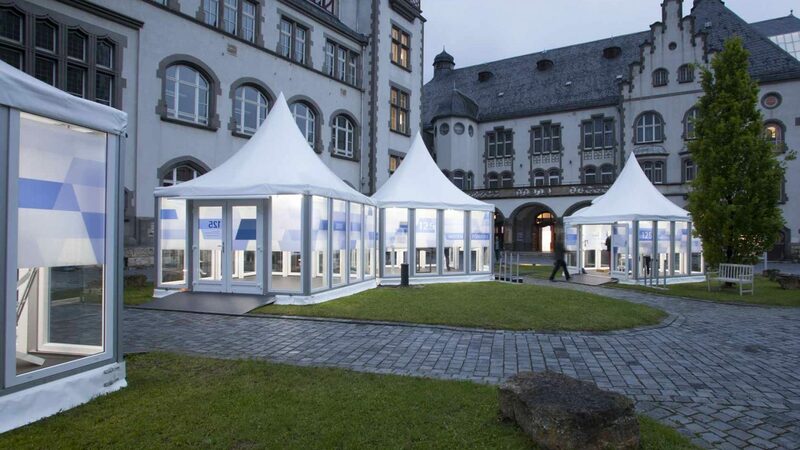 Four pavilions about „History“, „Promoting Knowledge“, „Zeiss“ and „Schott“ give insight into the turbulent history of the Foundation and its companies, vividly conveying accomplishments and innovations whilst providing a view to the future. The exhibition, which was opened before the start of the ceremony by Minister of Education Christoph Matschie before the Volkshaus, will be travelling to other locations of the Foundation´s companies before being integrated into the SCHOTT Museum in Jena.